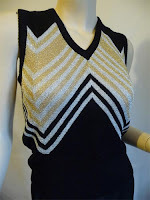 1970s Bellino lurex knit tank top. 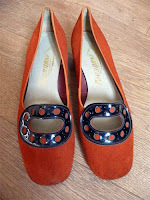 1960s orange suede court shoes. 1980s Givenchy 5 black & white dotty skirt. 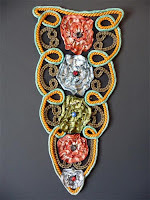 1920s Art Deco floral embroidered trim. 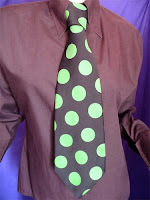 1970s Nina Ricci kipper tie. 1940s floral rayon tea dress. 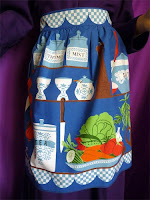 1950s-60s kitchen shelf print half apron. 1970s Greek maxi evening dress. 1960s floral fabric by Julia Killingback. 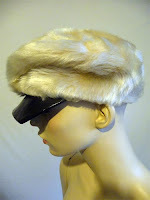 1960s faux fur cap with vinyl peak. 1940s-50s German carved wood bottle stopper. 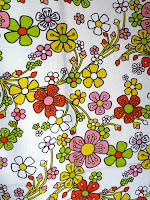 1960s stylised floral fabric by Bevis. 1970s star quilted dance dress. 1940s floral print cotton fabric. 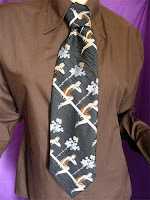 1970s kipper tie with 20s flappers. 1920s embroidered appliqué of exotic birds. 1970s negligee with matching shorts. 1960s primrose brooch by Exquisite. 1970s nautical striped knit tank top. 1930s celluloid costume doll in Victorian dress. Victorian Arts & Crafts style jacquard woven ribbon. 1950s expanding metal bracelet with photo of Liz Taylor. 1970s Terry de Havilland snakeskin platforms. 1980s pink & silver jumper. 1960s Japanese pose doll with dog. 1970s fruit print blouse by Londonpride. Selection of late 1970s-80s punk & new wave badges. 1940s CC41 faux astrakhan gauntlets. 1930s faux croc coin purse. 1930s silk charmeuse and lace half slip. 1960s-70s Sarah Coventry enamel ring. 1980s Marian Kenny punk souvenir doll. 1920s-30s French floral cloche hat. 19th century Maltese silk bobbin lace collar.